Compare prices from multiple car hire suppliers in Guarda to find the best available deal. A few of the car rental companies we compare include Gold Car, Budget, Avis, Hertz, Sixt and many more. The municipality of Guarda is located in the Centro region of Portugal. It has a population of 44,149 inhabitants (2011) and is 712.1 square kilometers of size. The municipality contains 55 different parishes, including Albardo, Valhelhas, and Monte Margarida. Within the municipality is the city of Guarda. 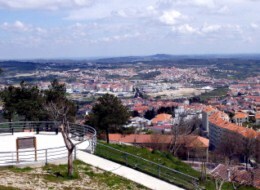 It is the largest city in the municipality as well as the highest city in all of Portugal, with an altitude of 1,056 meters. One thing to see is the Vila Nova de Fozcoa. It is a small village located in Douro’s International Protected Area. It is known for its beautiful vineyards and ancient rock figures, including the River Coa Valley Archaeological Park. The figures here were made hundreds of years ago. All around the municipality are a number of former fortifications and a beautiful cathedral. There is also the Baroque Misericordia Church. Guarda is serviced by the Francisco de Sa Carneiro Airport (OPO), informally known as the Porto Airport. It is located approximately 143.02 kilometers from the center of the city.